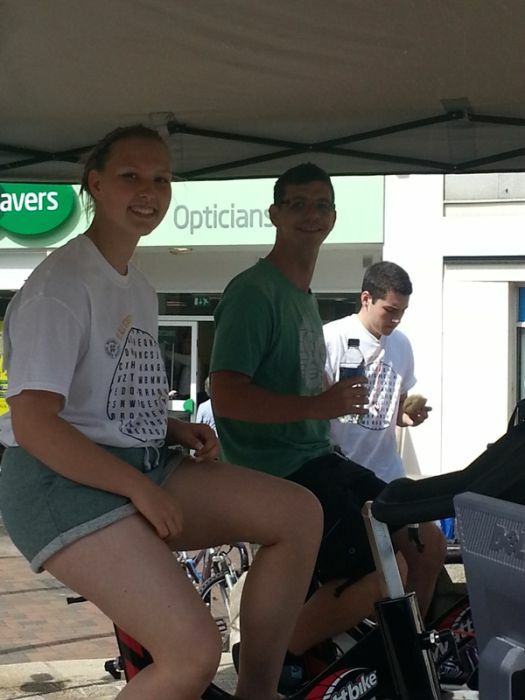 This week (Tuesday 12 August), 17 teenagers from Nottingham rode their static bikes 145 miles – the distance from Nottingham to Westminster – to help raise the profile of learning disability in politics ahead of the 2015 General Election. The group also took the opportunity to raise money for a Derbyshire-based service called Friday Friends, which holds weekly social events for adults with a learning disability in Long Eaton. The group were inspired to raise awareness about learning disability in politics by Mencap’s Hear my voice campaign. The campaign aims to unite the voices of the millions of people with a learning disability, their families, campaigners and hundreds of affiliated groups from all corners of the UK to ensure the next Government addresses the key issues facing people with a learning disability and their families. The teenagers arranged the event as part of the National Citizen’s Service’s Summer Programme, in which they are all actively participating. “Yesterday, our pedals flew the distance from Nottingham to Westminster, because we think that our Government has been ignoring the issues important to the learning disability community for far too long. But we’re just one small group of kids – and every voice makes us louder – so we want as many people as possible to join Mencap’s Hear my voice campaign. “What a day! These inspirational teenagers pedalled their socks off and put learning disability issues on the map. Their efforts really helped to raise awareness in the lead up to the 2015 General Election about how the serious issues that people with a learning disability face every single day are rarely, if ever, debated at election time. At yesterday’s event, the teenagers also raised money for a Derbyshire-based service called Friday Friends, which holds weekly social events for adults with a learning disability in Long Eaton. The team of teenagers raised a fantastic £266. They will also be holding a big fundraiser this Friday 15 August to hopefully add to this total. Be the first to comment on "Nottingham teenagers take on mammoth cycle to Westminster"